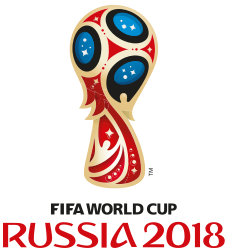 For the first time in the history of the FIFA World Cup, all eligible nations – the 209 FIFA member associations minus automatically qualified hosts Russia – applied to enter the qualifying process. Zimbabwe and Indonesia were later disqualified before playing their first matches, while Gibraltar and Kosovo, who joined FIFA on 13 May 2016 after the qualifying draw but before European qualifying had begun, also entered the competition. Places in the tournament were allocated to continental confederations, with the allocation unchanged from the 2014 World Cup. The first qualification game, between Timor-Leste and Mongolia, began in Dili on 12 March 2015 as part of the AFC's qualification, and the main qualifying draw took place at the Konstantinovsky Palace in Strelna, Saint Petersburg, on 25 July 2015. 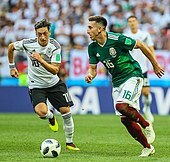 Wikimedia Commons has media related to Stadiums of FIFA World Cup 2018. Russia proposed the following host cities: Kaliningrad, Kazan, Krasnodar, Moscow, Nizhny Novgorod, Rostov-on-Don, Saint Petersburg, Samara, Saransk, Sochi, Volgograd, Yaroslavl, and Yekaterinburg. Most cities are in European Russia, while Yekaterinburg is very close to the Europe-Asia border, to reduce travel time for the teams in the huge country. The bid evaluation report stated: "The Russian bid proposes 13 host cities and 16 stadiums, thus exceeding FIFA's minimum requirement. Three of the 16 stadiums would be renovated, and 13 would be newly constructed." Twelve stadiums in eleven Russian cities were built and renovated for the FIFA World Cup. The Russian government had originally earmarked a budget of around $20 billion which was later slashed to $10 billion for the preparations of the World Cup, of which half is spent on transport infrastructure. As part of the program for preparation to the 2018 FIFA World Cup, a federal sub-program "Construction and Renovation of Transport Infrastructure" was implemented with a total budget of 352.5 billion rubles, with 170.3 billion coming from the federal budget, 35.1 billion from regional budgets, and 147.1 billion from investors. The biggest item of federal spending was the aviation infrastructure (117.8 billion rubles). Construction of new hotels was a crucial area of infrastructure development in the World Cup host cities. Costs continued to balloon as preparations were underway. 1 2 Fair play points: Japan −4, Senegal −6. Additionally, FIFA.com shortlisted 18 goals for users to vote on as the tournaments' best. The poll closed on 23 July. The award was sponsored by Hyundai. Prize money amounts were announced in October 2017. 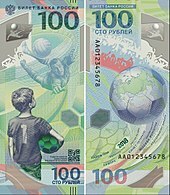 The tournament logo was unveiled on 28 October 2014 by cosmonauts at the International Space Station and then projected onto Moscow's Bolshoi Theatre during an evening television programme. 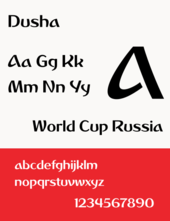 Russian Sports Minister Vitaly Mutko said that the logo was inspired by "Russia's rich artistic tradition and its history of bold achievement and innovation", and FIFA President Sepp Blatter stated that it reflected the "heart and soul" of the country. For the branding, Portuguese design agency Brandia Central created materials in 2014, with a typeface called Dusha (from душа, Russian for soul) designed by Brandia Central and edited by Adotbelow of DSType Foundry in Portugal. The official mascot for the tournament was unveiled 21 October 2016, and selected through a design competition among university students. A public vote was used to select from three finalists—a cat, a tiger, and a wolf. The winner, with 53% of approximately 1 million votes, was Zabivaka—an anthropomorphic wolf dressed in the colours of the Russian national team. Zabivaka's name is a portmanteau of the Russian words забияка ("hothead") and забивать ("to score"), and his official backstory states that he is an aspiring football player who is "charming, confident and social". The general visa policy of Russia did not apply to participants and spectators, who were able to visit Russia without a visa right before and during the competition regardless of their citizenship. Spectators were nonetheless required to register for a "Fan-ID", a special photo identification pass. A Fan-ID was required to enter the country visa-free, while a ticket, Fan-ID and a valid passport were required to enter stadiums for matches. Fan-IDs also granted World Cup attendees free access to public transport services, including buses, and train service between host cities. Fan-ID was administered by the Ministry of Digital Development, Communications and Mass Media, who could revoke these accreditations at any time to "ensure the defence capability or security of the state or public order". Match ball for the knockout stage, "Telstar Mechta". 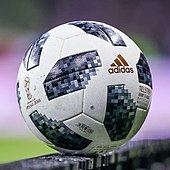 The official match ball of the 2018 World Cup group stage was "Telstar 18", based on the name and design of the first Adidas World Cup ball from 1970. It was introduced on 9 November 2017. After the group stage, "Telstar Mechta" was used for the knockout stage. The word mechta (Russian: мечта) means dream or ambition. The difference between Telstar 18 and Mechta is the red details on the design. The official song of the tournament was "Live It Up", with vocals from Will Smith, Nicky Jam and Era Istrefi, released on 25 May 2018. Its music video was released on 8 June 2018. Thirty-three footballers who are alleged to be part of the steroid program are listed in the McLaren Report. On 22 December 2017, it was reported that FIFA fired a doctor who had been investigating doping in Russian football. On 22 May 2018 FIFA confirmed that the investigations concerning all Russian players named for the provisional squad of the FIFA World Cup in Russia had been completed, with the result that insufficient evidence was found to assert an anti-doping rule violation. 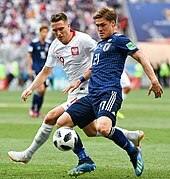 FIFA's medical committee also decided that Russian personnel would not be involved in performing drug testing procedures at the tournament; the action was taken to reassure teams that the samples would remain untampered. The choice of Russia as host has been challenged. Controversial issues have included the level of racism in Russian football, and discrimination against LGBT people in wider Russian society. Russia's involvement in the ongoing conflict in Ukraine has also caused calls for the tournament to be moved, particularly following the annexation of Crimea. In 2014, FIFA President Sepp Blatter stated that "the World Cup has been given and voted to Russia and we are going forward with our work". Allegations of corruption in the bidding processes for the 2018 and 2022 World Cups caused threats from England's FA to boycott the tournament. FIFA appointed Michael J. Garcia, a US attorney, to investigate and produce a report on the corruption allegations. Although the report was never published, FIFA released a 42-page summary of its findings as determined by German judge Hans-Joachim Eckert. Eckert's summary cleared Russia and Qatar of any wrongdoing, but was denounced by critics as a whitewash. 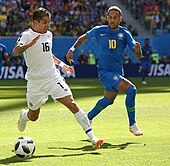 Garcia criticised the summary as being "materially incomplete" with "erroneous representations of the facts and conclusions", and appealed to FIFA's Appeal Committee. The committee declined to hear his appeal, so Garcia resigned in protest of FIFA's conduct, citing a "lack of leadership" and lack of confidence in the independence of Eckert. On 3 June 2015, the FBI confirmed that the federal authorities were investigating the bidding and awarding processes for the 2018 and 2022 World Cups. In an interview published on 7 June 2015, Domenico Scala, the head of FIFA's Audit And Compliance Committee, stated that "should there be evidence that the awards to Qatar and Russia came only because of bought votes, then the awards could be cancelled".